The chief of naval operations is disputing a Free Beacon report that revealed a Russian nuclear powered attack submarine sailed undetected in the Gulf of Mexico. However, Navy chief Adm. Jonathan W. Greenert, in a letter to a U.S. Senator, left open the possibility that the Russian submarine in question was later detected operating in waters close to the East Coast of the United States. "I would like to offer my personal assurance that based on all of the source information available to us, a Russian submarine did not enter the Gulf of Mexico," Greenert said in a carefully worded letter to Sen. John Cornyn (R., Texas), a member of the Senate Armed Services Committee. A spokesman for Adm. Greenert did not respond when asked if a Russian submarine had been detected operating near the U.S. East Coast. 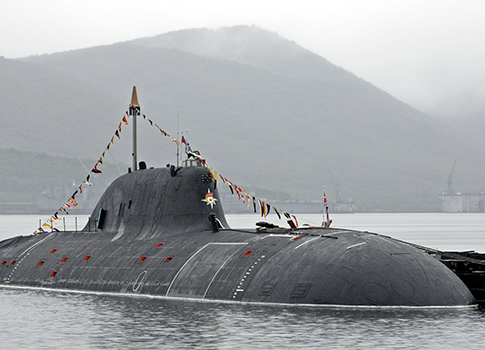 Two U.S. officials told the Free Beacon earlier this month that a nuclear-powered Akula attack submarine operated undetected in the Gulf of Mexico for several weeks and was not spotted until after it left the waters. One of the officials said the submarine was able to evade detection for a month. A second official said the Akula is designed specifically to attack U.S. ballistic missile submarines, like those based at the Navy’s largest East Coast missile submarine base at Kings Bay, Ga.
Those sources continued to assert that there is sensitive intelligence information indicating the Russian submarine was able to sail undetected in the Gulf, activity that would likely embarrass the U.S. Navy. The sea service is responsible for protecting U.S. ballistic missile submarines from attack submarines, and in the past operated a network of underwater sensors designed to detect foreign submarine movements. A Russian military spokesman declined to comment on the Free Beacon story after it was published Aug. 14, citing a policy of not discussing submarine operations. Pentagon and Navy spokesmen initially declined to comment on the reported submarine incursion, citing restrictions on discussing intelligence and sensitive submarine operations. After publication, however, Pentagon spokeswoman Wendy Snyder stated that the Free Beacon story was "false." However, she refused to answer any questions about whether a Russian submarine was operating in the area. In its report, the Free Beacon stated that the unusual attack submarine incursion in international waters took place around the same time Russia flew strategic nuclear bombers close to U.S. coasts in Alaska and California, prompting U.S. interceptor jets to monitor their flight. The July 4 Bear H bomber incursion near California was said to be very close to U.S. shores and a bomber flight by Russian strategic nuclear forces not seen since the Cold War. The last time a Russian Akula attack submarine was detected near U.S. shores was in 2009, when two Akulas were spotted. Those submarines and the recent incursions have raised new concerns among some U.S. officials about Russia’s growing military assertiveness. Russia is opposing U.S. plans for missile defenses in Europe and a top general recently warned that Moscow could take preemptive military attacks on European missile defense sites. This entry was posted in National Security and tagged Media, Navy, Russia. Bookmark the permalink.